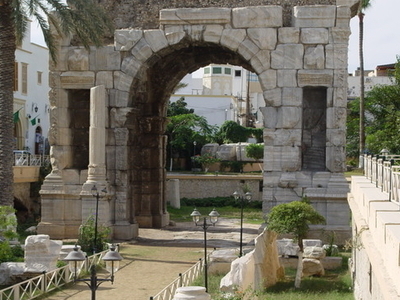 The Arch of Marcus Aurelius is a Roman triumphal arch in the city of Oea, modern Tripoli, where it is found near the northeastern entrance to the Medina (old town). It is a quadrifrons trumphal arch, surmounted by an unusual octagonal cupola. The Arch was erected (entirely in marble) by Gaius Calpurnius Celsus, quinquennial duumvir of the city, to commemorate the victories of Lucius Verus (junior colleague and adoptive brother of the Emperor Marcus Aurelius) over the Parthians in the Roman-Parthian War of 161-66. Here's the our members favorite photos of "Monuments in Rome". Upload your photo of Arch of Marcus Aurelius!